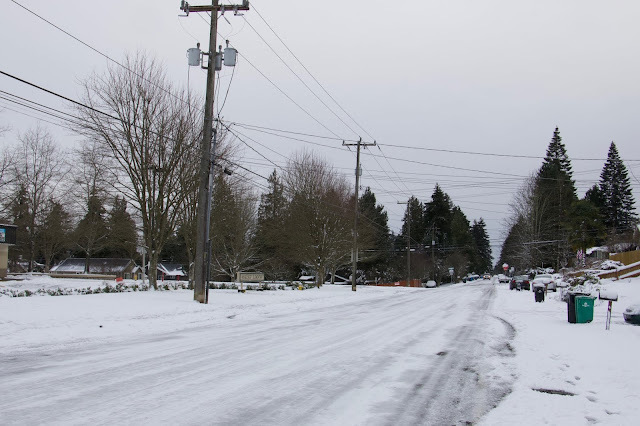 10th Ave NE, in front of Ridgecrest Elementary February 5, 2019. The Winter Storm Watch for Monday afternoon - Tuesday afternoon remains in effect. We are under a Winter Weather Advisory until Monday at 4am. We've already received between 2-3 inches of new snow in the Shoreline area Sunday evening. We are expecting a total of 2-4 inches before the snow showers end shortly after midnight tonight. The next storm is expected to arrive Monday afternoon. There is much uncertainty with this storm's track, and it may bring in some warmer air in the upper atmosphere at times as it wobbles past the west coast. By Tuesday afternoon we are still expecting a storm total of 5-6 inches of new snow. It's possible to see some freezing rain, sleet, graupel or other wintery mixes at times Monday afternoon into Tuesday. Forecast for the remainder of the week continues to have a lot of uncertainty with temperatures and snow levels. More snow showers are expected Wednesday and Thursday. There's a possibility that we will warm up briefly Thursday night and Friday for some rain, and wind. More cold arrives in the weekend though for another chance of white stuff. I want to stress that forecast models are running with a high level of uncertainty and that anything is possible for this week. We are expected to stay cold, but some models have us on the margin of freezing, allowing for some cold rain or freezing rain at times. Other forecast models indicate we could have 20 inches of snow on the ground by Thursday. Bottom line: Winter weather conditions are likely for at least another 5-7 days in one form or another with some possible breaks in between storms. At this point the biggest impact will be travel, especially if we get freezing rain.